Our 7 year old had his 100th day of school. 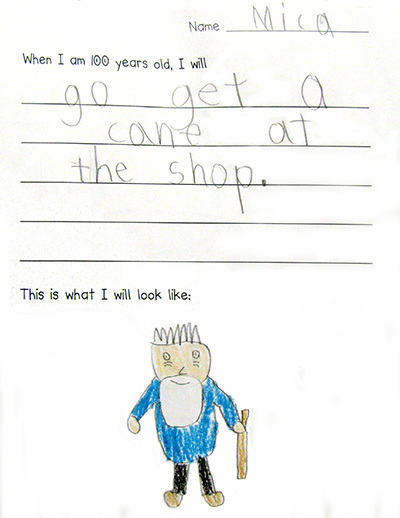 He had to write and draw what he'd look like at 100 years old. Daddy said, "He'll have a hard time hearing for 100 years." He always forgets to draw the ears. It's good to know he'll have a cane to help him get around. Ahaha! I love it! I should try a similar activity with my students. Thanks for sharing! Awesome drawing!!! Really. He looks like King of the canes! That is cute! He knows what is likely to be the case at 100. Smart kid. Thanks for hosting and Happy WW Alissa! I am loving your son's school activities. This is just wonderful and so cute! My linky is up too if you want to pop over and get added! At least he'll still be smiling! That is precious! The picture is so cute. That is just too cute! I hope that's all he needs, too. Love his drawing. Cool that remembered about the cane. oh my gosh! this is hilariously cute!! That's actually pretty intelligent he thought of the cane! This is surely a picture to save! Most men don't listen as it is, so ears aren't needed, unless they need them to hold up their glasses. MOL. Purrs and hugs, the kitties at www.thecatonmyhead.com, Lily Olivia, Mauricio, Misty May, Giulietta, Fiona, Astrid, Lisbeth and Calista Josette. hahaha! that is wicked funny! Such a cute picture and I love the 100 day celebration! I've linked my 1camera1mom here, where you can find more pics of him too. Oh that is soooooo sweeeeeet!!! Beyond adorable..
Ahahahaha! I'm sooo not a details person. I didn't even notice the lack of ears. Mica will be a super cute old man! I just love seeing the world through a child's eye's. Now that is triple cute heheh! awww! What a great picture!! Very creative. Hahahaha.... Leave it to Mica!! I still say he is going to be an artist! My daughter drew like him when she was young and now she is a fantastic artist! I should have posted Graham's. His said he was going to be a grand daddy! LOL!